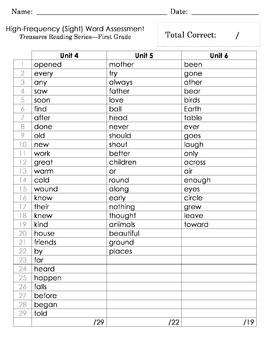 Treasures Reading Series High-Frequency Words Assessment Slides with Recording Sheet for First Grade! Includes all units; Start Smart through Unit 6! 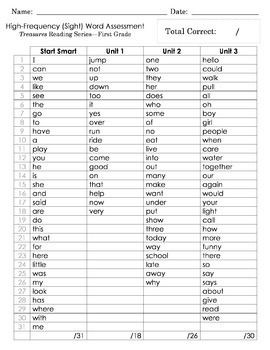 Easily assess your students' sight word knowledge and automaticity with this timed .PPTX presentation. Also available in .PDF format for use on an iPad through various apps such as Evernote. Quickly record student responses with the included recording sheet. 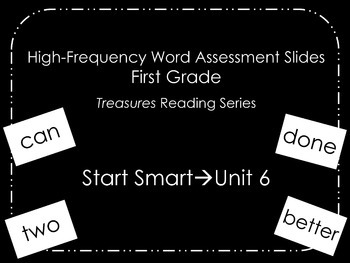 The high-frequency words included in this product are aligned with the Treasures Reading Series (First Grade) and include all units in the series from Start Smart through Unit 6.